You might have only heard about clipboard in passing, but did you know it’s one of the top five most popular commands in Windows? Data from Microsoft Office indicates that the average user pastes 10 times per day. With a whopping 2.3 trillion paste events every month it’s a good thing we no longer rely on glue. Since the very beginning of Windows history, clipboard has acted as a virtual corral behind the scenes, temporarily holding copied content—whether that was a single word, an image, or your college essay—until you copied something else. One item was held in the clipboard at a given time, with each subsequent piece of content overwriting the one that came before. At the time, that made sense. When clipboard was designed, most people owned a single computer if they owned one at all. And multi-tasking had more to do with physical chores than with the digital world. Nowadays, however, many of us live and work with multiple devices—laptops, tablets, readers—many connected via the cloud. Having them all at our fingertips makes it easy to create documents on the fly and capture important information as soon as we have it. But it can also be frustrating to have your edits limited to a single project or the single device you happen to be working on. For the Windows 10 October 2018 update, the clipboard team worked across continents, from Japan to Redmond, WA, to solve the issues that mattered most. Teams in Tokyo worked on visuals and UI, while those in the US tackled cloud features and the platform. Using Skype to collaborate online across different time zones, they considered how to make clipboard more versatile, all the while taking special care to protect your privacy and security. Windows now leverages the cloud to sync across devices and uses special security features that enable you to be more productive while remaining protected. If you choose to enable syncing, you can access your copied content from any Windows device you’re logged into and add or modify it at a moment’s notice. You can review what you copy in the clipboard history viewer, hold multiple pieces of text and images there, and share them with any other Windows devices you’re logged into. And as for your security? Your data can be synced automatically or manually, depending upon your personal preferences and your organization’s rules and regulations. 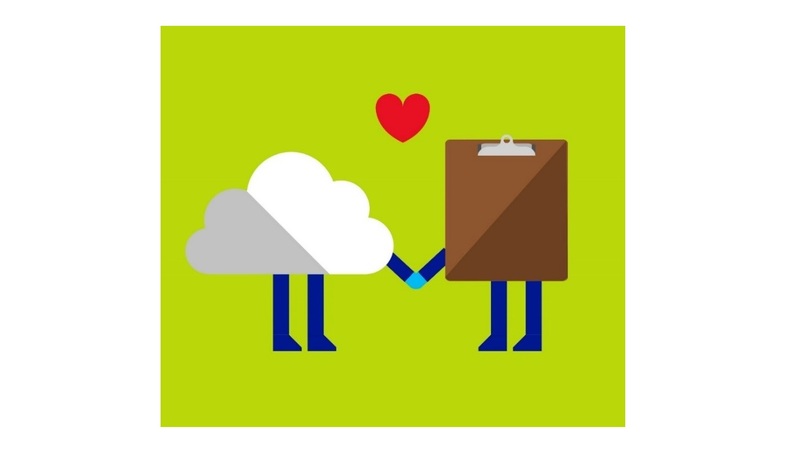 Those items stored in the cloud have a lifetime of 12 hours and can be deleted at any time. 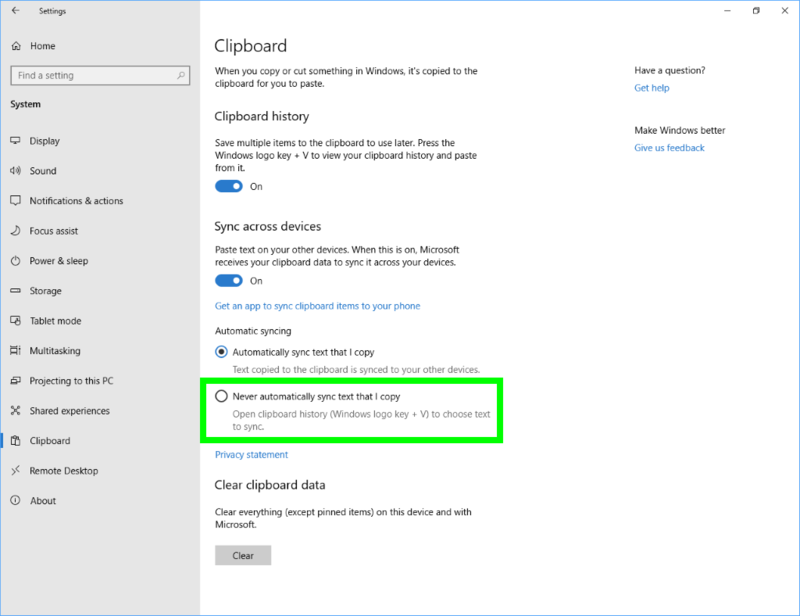 To sync your clipboard data across all your Windows 10 devices you’ll need to go to clipboard settings. You can get there quickly by typing clipboard settings into the Windows search box. Once you open clipboard settings, set the Sync Across Devices toggle to On. 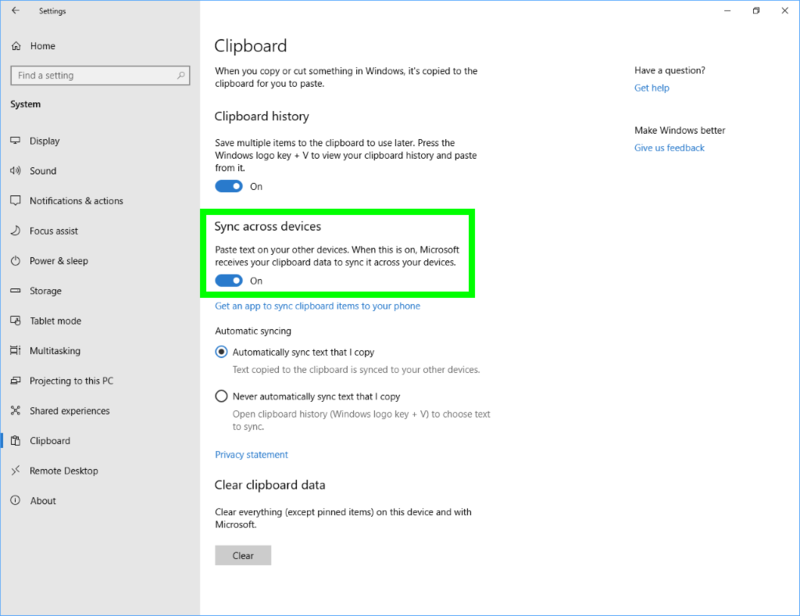 If you select Automatically sync text that I copy, Windows 10 will automatically synchronize everything you copy to the clipboard to your other Windows devices—including potentially sensitive data like passwords. If you prefer to sync your texts on a case-by-case basis, select Never automatically sync text that I copy instead. While still in clipboard settings you’ll also want to switch the clipboard history toggle to On. Doing so will allow you to see previously copied items in clipboard. Try it now: highlight the text you want to sync, then locate it in your clipboard history using Windows key + V. Then, click on the cloud icon to sync that text to your other devices. Imagine you’re riding the bus home from work when you receive sudden inspiration for a PowerPoint presentation you’ve been working on. Because you don’t want to forget your idea, you jot it down in an email or text and send it to yourself. Tomorrow, back at work, you’ll open your email or text, copy what you wrote, then paste it into your PowerPoint presentation. Whew. That’s quite a few steps. With the updated clipboard, you can copy your idea from any of your Windows devices and paste it to another Windows device, pronto. Just select the content you want to copy by highlighting it and copy it by pressing Ctrl + C. You can open your PowerPoint presentation on a separate device and paste it there by pressing Ctrl + V. But even if you don’t paste it immediately, clipboard will retain what you copied for later use. Press Windows key + V. You’ll see the clipboard appear—and within it, your copied content. When you open clipboard, the most recent item copied will appear at the top, and older items will follow in chronological order, including recent texts synced from other devices. Your clipboard history will retain what you’ve copied for the duration of your Windows session. Have content you know you’ll want to use even after you close your Windows session? Consider using the Pin function. Say you’re convinced that the idea you had on the bus is worth repeating. You want to insert it into a few other pertinent documents. Maybe you even wanted to boast about it to a friend or colleague. You can retain your clipboard items—even after you clear your history or reboot your PC—by clicking the Pin icon or pressing the P key. Pinned items will be available in a list for you to use even after your Windows session has ended. Pin items that you frequently use, or that you consider so brilliant you’re compelled to share them again and again. If at some point your idea loses its luster and you no longer want to keep it with your pinned items, you can click the Pin icon again or press the U key to unpin it. It’ll still be saved in your clipboard history. If ever you want to delete it completely from your PC and the Microsoft cloud infrastructure, click the X button or press Delete on your keyboard. Clicking Clear all at the top right corner of the clipboard will clear everything except for the items that you’ve pinned. Physical clipboards, originally patented around 1870, were designed to help users collect their papers and, like a mini mobile desk, offer physical writing support. Now, almost 150 years later, with the help of the clipboard team, the updated clipboard gives you flexibility in terms of where and how you work by enabling limitless edits across multiple devices. The next time inspiration strikes you, don’t hesitate to copy it to the clipboard. No matter how big or small your idea, it’ll be at hand when you’re ready to paste.